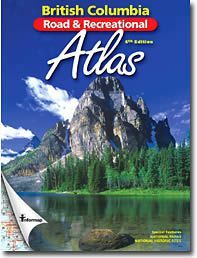 Road and recreation atlas of British Columbia showing different types of roads (highways, paved roads, gravel roads and rough roads), ferry routes and tours, railways and trails. Also has ample recreation information such as campsites, parks, reserves and more! 165 total pages: 88 of maps at a scale of 1:600,000 and 77 pages with information on different regions, parks, camping and a distance chart. Item Number Size / Scale Price Qty.